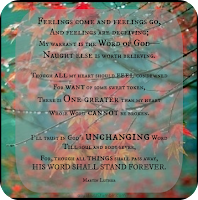 Luther: For feelings come and feelings go, and feelings are deceiving; My warrant is the Word of God, Nought else is worth believing. 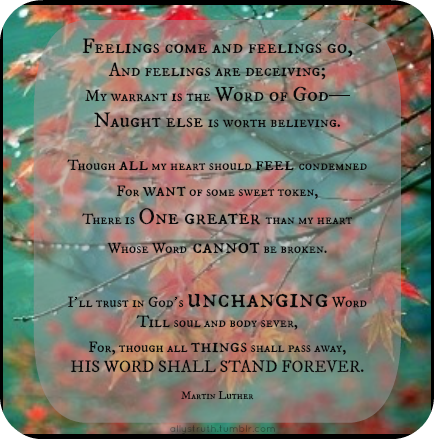 My warrant is the Word of God, Nought else is worth believing. A quick Google search reveals how far this quote has traveled. A Google books search demonstrates how often it has been published, particularly in the 21st century. Norman Geisler used a snippet of it in his book, Christian Apologetics. 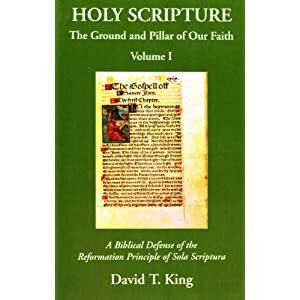 Alistair Begg published it as well. After spending some time looking for a meaningful reference (I did not come across one), it seems hard to believe that the rhyming quote version is from the pen of Luther. How convenient that the words Luther is purported to have written (either in German or Latin) rhyme so well in English! Then again, the English version of A Mighty Fortress is Our God has an adequate rhyming scheme. It would be interesting to see the full version of this snippet view from the 1943 Lutheran Witness. It looks to be very similar. So it appears that the core of this quote has been around at least 100 years. It does sound suspiciously like a Table talk entry, but in my brief search of the extant English versions I didn't come across anything. It also sounds like a hymn, but I didn't find anything from Luther's hymnody. There is this hymn God's Word Shall Stand Forever, "attributed to Luther," but this should not be confused with this hymn. That the Forgiveness of sins must pass through all things. Denny Burk: "Today's Supreme Court decision was a moral and judicial travesty"
Denny Burk: "A Prophetic word 11 years ago from John Piper"
Rod Bennett's lecture on You Tube - "The Four Witnesses Brought me home"
Please watch and listen to the video first. You may not understand what I am getting at in my article there after the video of Rod's lecture, without listening to Rod first.